Although GParted is a free partition editor, it still has some disadvantages. Partition software which can take the place of GParted for Windows 2003 Server - AOMEI Partition Assistant Server Edition. Many Windows 2003 Server users will come to this situation: partitions space become smaller and smaller as time passed, especially the C: partition. So they want to resize the partition. Some people turn to professional partition tools, but they are too expensive and cann’t afford it. Some geeks like free things. GParted for Windows 2003 Server is a good choice because it works well on it. GParted(Gnome Partition Editor) is an open-source program that can modify your partitions without losing data most of the time. It works great with RAID and NTFS partitions. However, because it is free, so you use it at your own risk. Therefore, it’s important that you create a good backup before you try GParted. Failure during repartitioning could cripple a server or workstation. As I mentioned above, some geeks like GParted. However, to use GParted, you must first download the CD Image file (.iso file) of GParted Live for this program. What’s more, it’s not as easy to use as some commercial solutions, not everyone are geeks. And it needs spend lots of time to learn how to use. Another reason I gave up GParted is that Windows doesn’t really like GParted because it’ll require a repair action from the Windows disk management sometimes, this conclusion is made through multiple tests. Good news is nowadays there is a server partition manager supports Windows 2003 Server very well. It is ease to use and its paid edition is also cheaper. But don’t doubt its professionalism. AOMEI Partition Assistant Server Edition is a rising star and gets many great reputation from software industry. In conclusion, AOMEI Partition Assistant Server Edition can completely take the place of GParted for Windows 2003 Server. 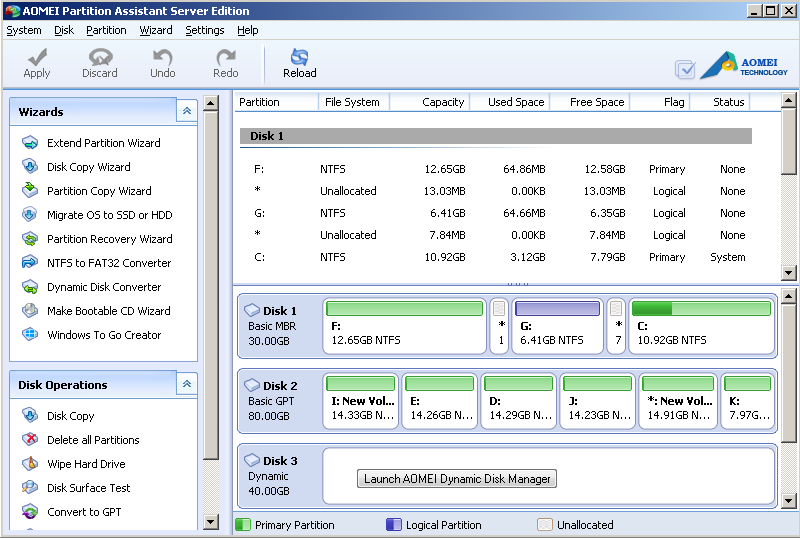 AOMEI Partition Assistant Server Edition, is designed to meet the needs of small and medium-sized enterprise. To minimize production server downtime, it brings two key functions that enable you to extend partition without stopping and restarting the server system, so you can solve low disk space problem while ensuring business continuity. To maximize disk space usage of your server, it integrates a series of functions, which allow you to rapidly repartition hard drive or change partition size without losing any data on the server. To let your Windows Server 2003 benefits from and keep up with latest hardware, that is, SSD and more than 2TB hard drive, AOMEI migration function and copy wizards are the best ways to update your system and data storage device. Even every features of GParted can be achieved by using AOMEI Partition Assistant. Creating partition, deleting partition are basic operations. Some advanced operations are mentioned above, I think you’d better try it by yourself, because they are really very fun. Our website has lots of tutorial. AOMEI Partition Assistant Server Edition not only supports Windows Server 2003, but also Windows XP/7/8/8.1, server operating system: Windows Server 2012(R2), Windows Server 2008(R2), both 32bit and 64bit. It supports all the storage devices which can be recognized by Windows, such as IDE, SATA, SCSI, SSD, USB external disks, flash drive, Fire wire disk, Hardware RAID and Flash drive and so on. It is able to support MBR (under 2TB) and GPT (larger than 2TB) with 128 hard disks, with file system FAT, FAT32, NTFS and also EXT2, EXT3. All in all, its friendly and easy-to-use interface makes anyone, even non-technical users, can maximize the performance of servers in minutes without professional knowledge. Such an amazing software displaces GParted for Windows Server 2003 is no question about that.